I finally did it. After a couple of tries in the past four years, I finally finished The World’s First Love: Mary, the Mother of God. 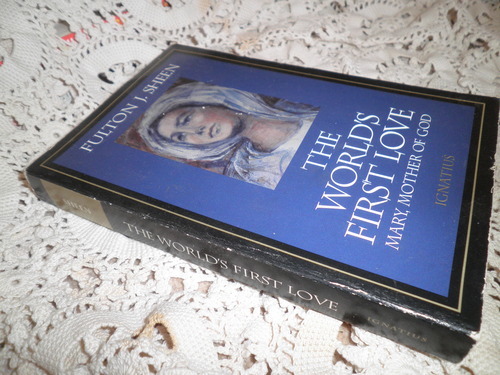 I enjoyed reading Fulton Sheen, and I learned a lot, not only about Mary, but about the Bible, the role of the Church, and the changes in the “modern” world taking place in 1952 when the book was originally published (which apply quite accurately to 2011, too). There was also some great info on St. Joseph, the complementary roles of men and women, and faith in relation to modern wars, politics, and technology. I could ramble more about the highlights, but I think that you should just read it yourself. Catholic or Protestant, I highly recommend it. The book really centers around Christ (because let’s be honest, you can’t learn anything about Mary without learning about Him). Her only job is to lead us into a deeper relationship with her Son. If He is the sun, pouring out power and light on the universe, she is the moon, not creating any light of her own, but reflecting His light into a dark world. Don’t we all desire to reflect His light in the world, to be radiant in His eyes? I am grateful to have Mary as a model.